On September 29th of this year, the Christian community quietly lost a huge saint in the faith. 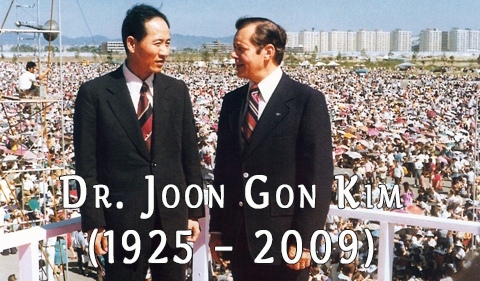 Dr. Joon Gon Kim was the national director of Campus Crusade in Korea for the last 40 years. He is the first person to have started a national Campus Crusade ministry outside of the USA. He led his ministry with unshakeable faith, spearheading Christianity’s growth in Korea. Early in life, he was flogged by communists who also murdered his family before his very eyes. However, Dr. Kim forgave the communists and even converted them to Christ. This act of forgiveness paid massive rewards in the kingdom celebrating the heart of Christ. His work in South Korea had massive milestones as EXPLO 74 where 320,000 gathered and later in 1980 Here’s Life South Korea which had 3 million. Today, 25 percent of Koreans profess to be Christian and Korea sends more missionaries than any country but the US. So when I say “quietly lost”, his passing was only quiet in the US. Below I have attached an article from Steve Douglass that he sent out to former Campus Crusade staff. From a human perspective, Dr. Kim should not have lived to be even 30 years old. Late in the World War II, he was conscripted by the Japanese army to serve with other Koreans as a human shield against the advancing Chinese armies. He escaped, but then fled through frigid mountain terrain without adequate food or clothing. But after that, he was captured, beaten and left for dead by the Communists during the Korean War. He was recaptured and almost killed again by the Communists. Dr. Kim endured great suffering both physically and emotionally. through it all, instead of growing bitter toward God, he drew much closer to God – being refined like fire refines gold. I did view Dr. Kim as “soft-spoken” – until I heard him preach in Korea many years ago. At one of his memorial services, they showed several clips of him preaching. He was very animated and passionate. At times he would elicit from the crowd “cheers” or “chants” for Jesus as Lord and the answer to all of our questions and problems. His heart burned not just for the evangelization but also the Christianization of Korea. He worked hard for the gospel to spread to North Korea, China and beyond. He constantly challenged people to pray for, give to, and go into missions. At the World Evangelism Crusade in 1980, 100,000 people committed to being involved in missions. In 2001, a survey was done that discovered that 80 percent of all people working in missions departments of Korean churches had been involved in Korea Campus Crusade for Christ. Dr. Kim was very well known for his faith. Examples abound, but I will share just one. I was in the audience of 80,000 at EXPLO 72 in Dallas when Dr. Kim publicly announced the upcoming EXPLO 74. He said it would be in Seoul, Korea, in just two years and hoped to attract 300,000 people. That was almost four times the size of EXPLO 72, and I knew what incredible effort went into that for over two years. In the next two years, there were many seemingly insurmountable challenges, but God did provide. More than 300,000 people did attend. And EXPLO 74 contributed significantly to the rapid growth of the Korean church in the years that followed. Dr. Kim is a superb model for all of us. He walked with God despite severe suffering. His heart burned with a passion to reach the lost. He learned to believe God for the impossible. We would do very well to follow him as he followed Jesus. I spent two summers in Japan with Campus Crusade for Christ in 1985 and 1986. I had the privilege of hearing Dr. Kim speak on two occasions, once in a Japanese church, and in the airport lounge in Seoul, Korea. I don’t remember what he said, but the thing that most touched me was the aura of humility and godliness the man had. Through his sufferings, I think he learned something most of us believers have not. Heaven’s gain was our great loss. Thank you Jesus for this man. Thank you for your comment. I never had the opportunity to hear him personally, but I am moved by his story and commitment to love. It’s an amazing testimony to a heart committed to Jesus.